Old is New Punch Needle! 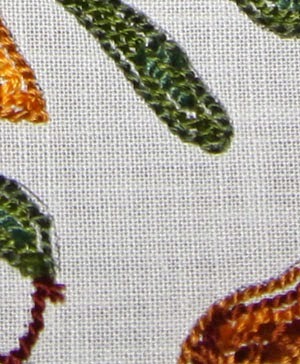 New Punchneedle Design: Antique Ducks and Winner! First Christmas Finish and Rug Punching! This week I decided to work on a pattern, I have made before. The original one was done with colors that washed each other out, so I wanted to try it in bolder colors with a dark background. The design is based on an antique red ware plate. I was going to do it in 3 strands, then decided it was large enough to do in 6 strands and a faster way to finish it. I am debating on wether I want to do more rows around the piece, or I may do a braided cording. Not sure if I want to keep it as is, or maybe mount it on a box or basket. My niece got a giant dollhouse and I was thinking this might make a nice rug for it. I haven't worked it into a pattern yet, hopefully I can get that done this weekend. I still have to clean some areas up and a few fills where I missed, then I can finish it off. My hands have been bothering me and my brain is off a bit, so my punching does not match the actual design, it is supposed to be oval. I also found a fun free tutorial for a Valentines quilt. I wanted to make one with some pastels that I have and try out my new rag die to see how it cuts. I had an idea of doing a rag quilt and adding a heart, here and there and today I stumbled on a quilt, exactly like that, so now I can follow her guidelines. You can find the pattern and tutorial at, Sew4home. I hope all of you who are in the path of the storm, stay safe and are prepared in case the power goes out. I thought I would post early, just in case. We have a generator, but it doesn't power the heater, so I hope we don't lose power for too long. 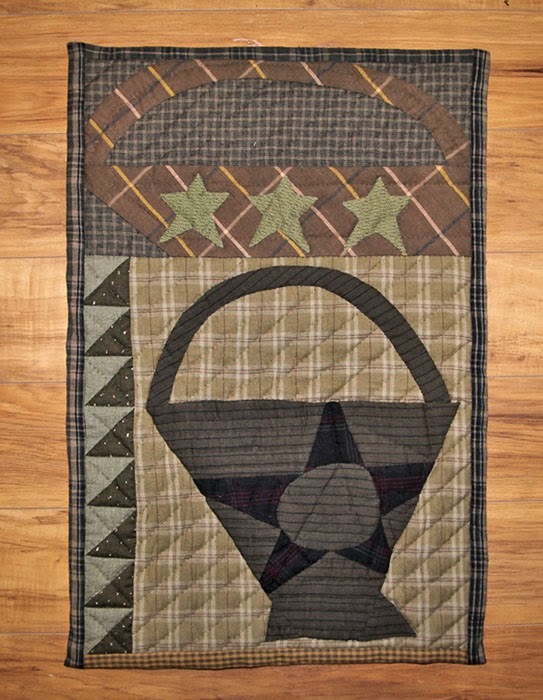 A friend send me some quilted pieces that she didn't want so I decided to add a border to one. Since it was already quilted, I couldn't do a real border, so I just added a small edge to border it. I think it needs something though, maybe a saying, or some birds, what do you think? I lightened it up a bit, but the shades are much darker. I also need to press down the edges, but will wait until I decide what to add to the piece. If you were wondering what else you can do with my designs, Karen made a beautiful Pin keep with hers. 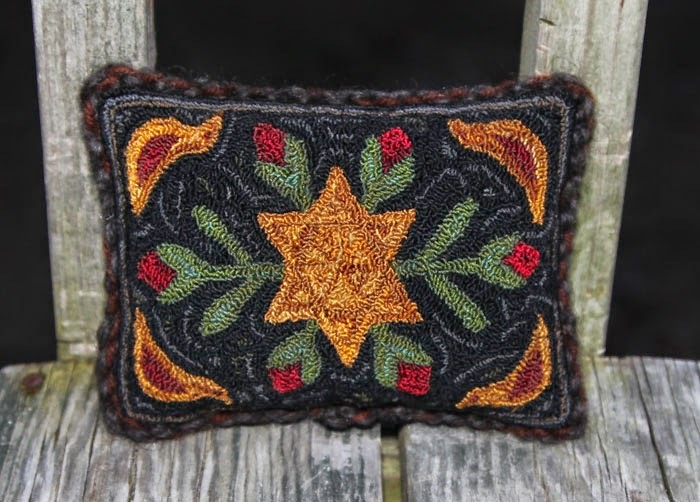 I love the wool colors in her piece and it is a nice idea for small or larger wool projects or you could make a table runner by adding the ducks to the end of the piece, with the star in the middle. I finished my new piece this week and I am please with how it came out. It is so hard to get the true colors in a photo, but I love the contrast between the dark background and the brighter design. I had an idea of doing it with a hit or miss star and more prim shades and making it into a rug, for my niece who got a large dollhouse last Christmas. I will have to see how she has decorated it so far and then I can make some rugs to fit her style. The design is done in punch needle and comes in an epattern with a color photo, basic colors and instructions, as well as a line drawing of the design, so you can reduce or enlarge to fit your project. 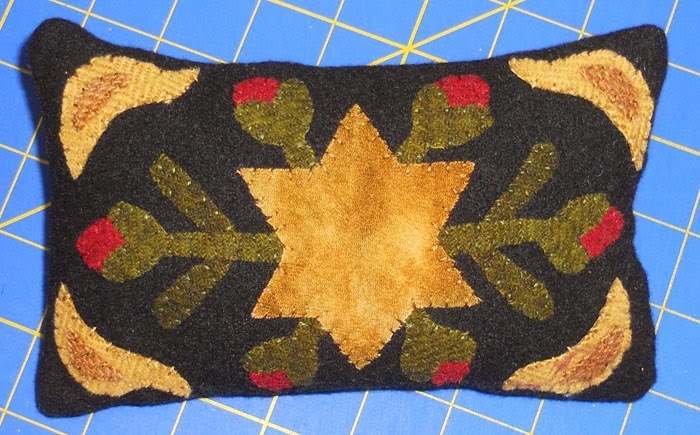 The finished pillow is 6 1/2" X 5". 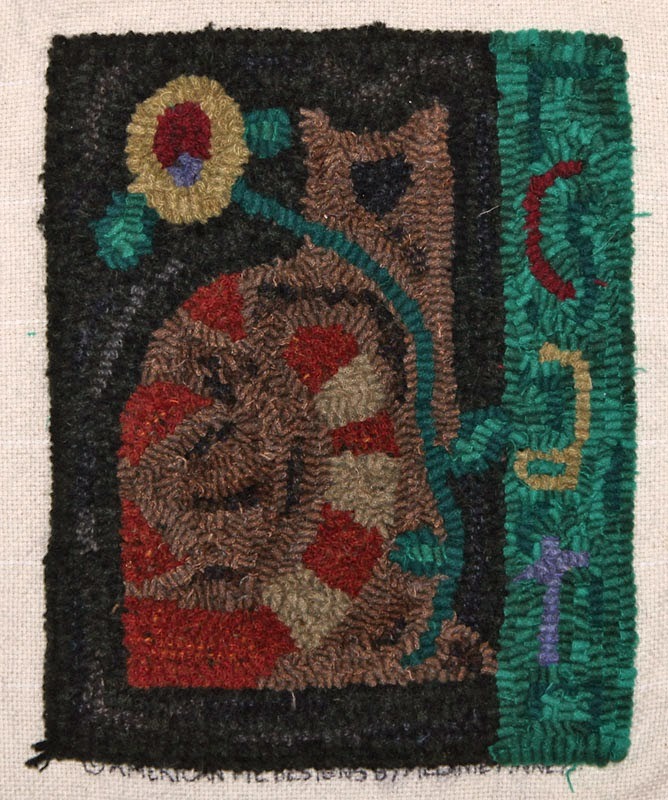 It is an adaptation of an antique rug and could be done in wool appliqué, as well. And now for the winner of the free pattern. The winner is Lecia of Farmhouse Prims! Lecia, email me with your choice of epattern or booklet and congratulations. I hope everyone has a wonderful weekend and are not in the path of the storm, that is coming our way. And for this weekend, if you buy any one of my epatterns, you get one for free. The free pattern must be of equal or less value, as the one you bought, so great time to get some patterns for the coming seasons. To get your free pattern, put the name in the comment section of your order. The piece is more prim and muted in person, the flash tends to pick up certain colors and make them pop. I also made my piece a bit off centered, but the pattern has been modified and straightened. 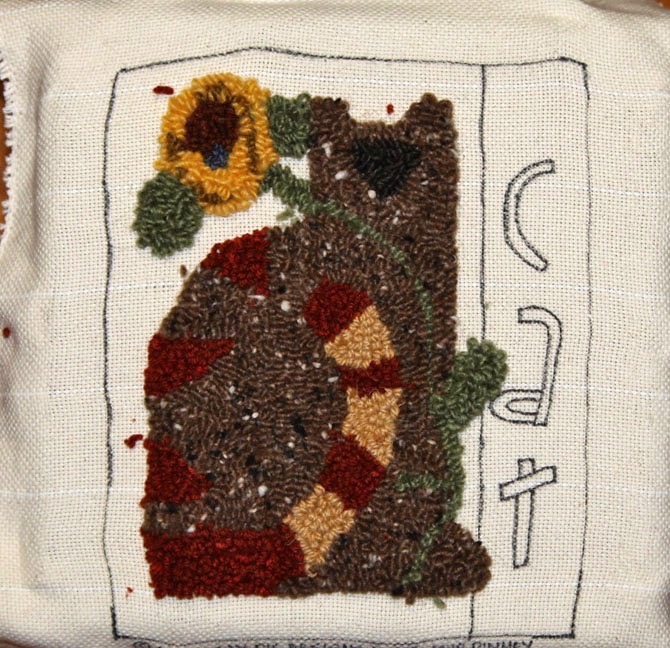 This week I started a new punch needle design, adapted from an antique rug. I am keeping it simple and somewhat true to the original for basic colors. Since I will have a new pattern, hopefully by Friday, I will have a giveaway of one of my epatterns. It can be the new one or any of the epatterns on my ecrater site. I will pick a name on Friday and announce the winner on that posting. Can you guess what might be in the design? Today was cleaning day and my bed. The kitties like to sleep on my bed and after a week, I get tired of inhaling cat hairs. I shut the door so they can't get it dirty before i got to sleep and Moki found another favorite place to sleep. 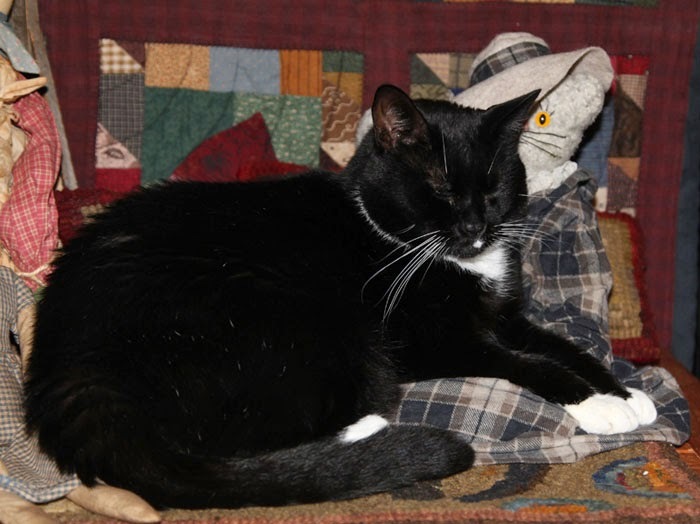 My kitty dolls make great pillows. Then he decided to sleep on the dog's blanket. 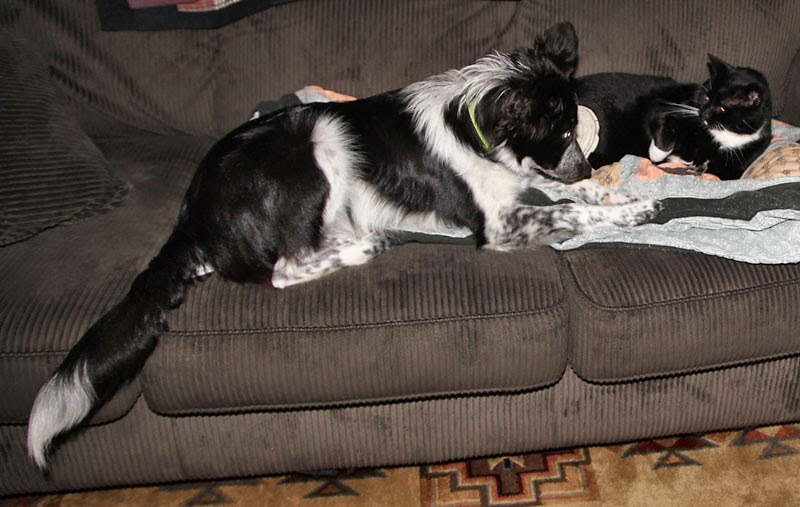 Bean let him enjoy it for awhile but it didn't take long for him to get up and give Moki, the please play with me look. Bean still doesn't understand that kitties do not throw balls. Though mine do steal his and roll them down to the cellar. This week I wanted to make something to add to my tree, but I am limited on time and wanted something quick and easy. I searched the web and found a wonderful place with free printables that you can use on a tree or just to decorate. I was also looking at her vintage cards that you can stand on a shelf, might print those out, this weekend. I printed my designs out on card stock so they would be stiff enough to hang and the aged card stock gives the prints, more of an aged look, instead of using white. I also printed out some by accident with regular paper, since I forgot to put a piece of card stock in. I used the paper hearts for the back of my hearts and just used a stick glue to put them together. I used a piece of black floss and made a hanger by threading it through the middle. Simple project to do while you watch tv. I changed my kitty doll with the one dressed in red, to match the setting, better. My camera was acting up again so I took a photo without the flash. It yellowed the photo, but the valentines are that color in person. 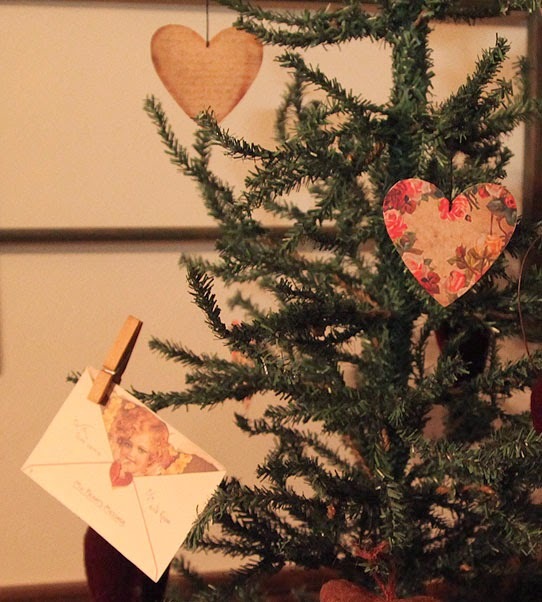 I reduced the sizes of the hearts and the envelope to fit my tree. I used the hearts with flowers and the one with writing on it. You can find the designs for these and a lot more at Wings of Whimsy. Another thing I wanted to try was, dying velvet. 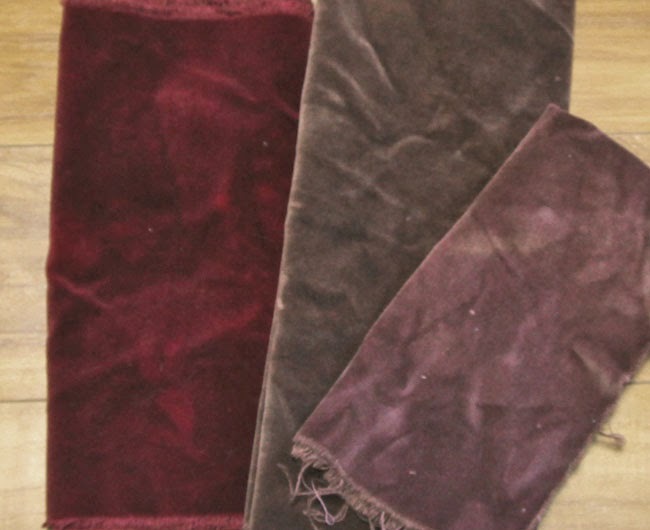 I read about dying velvet online and it all depends on what type you have. I have no idea what type I had, but I assumed it was not natural fibers and I was right, it took the Rit Dye. The bad thing was, I used brown and without thinking, put the red piece in with the others, so the dye bath turned reddish brown. The original colors I used were, bright red, tan and white. The red got darker and has a nicer mottled look, the tan turned browner and the white is a pinkish brown. Next time I will have to try it without the red. I like how it comes out, after washing and drying, gives it a nice aged look. And I am also working on a new project. I wanted something simple that I could use for Valentines and spring and decided to use a pattern by Quilts by Cheri, called Live Simply. This is one of her older patterns and there is a fourth block, but I decided to do three and make a longer piece for my wall. 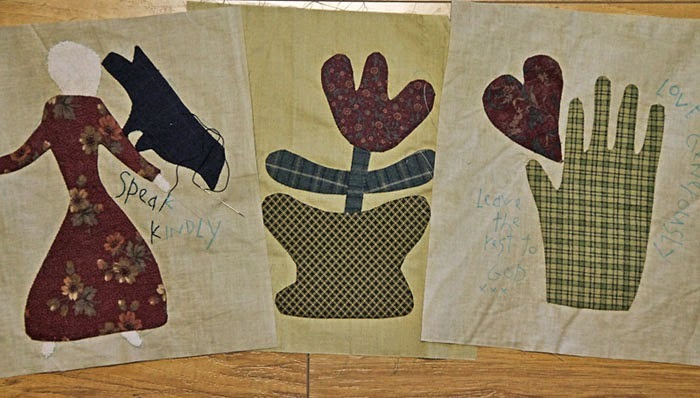 Once I finish the stitchery, I can put them together. My camera flash decided to go wonky and for some reason when I take a shot, facing down, my lens starts moving on its own, so I guess it needs to go to a shop and see what is wrong and maybe get a good cleaning. I am also using washable, one sided, fusible to see how I like it. I will talk more about what I do and don't like, after I finish the piece and my brain is working again;) I hope everyone has a good weekend. I didn't get anything made this weekend, but I finally got all of my Christmas decorations down. The only problem is, my house looks empty since I don't have too many Valentine items. I did spend the weekend out and about, shopping and antiquing. 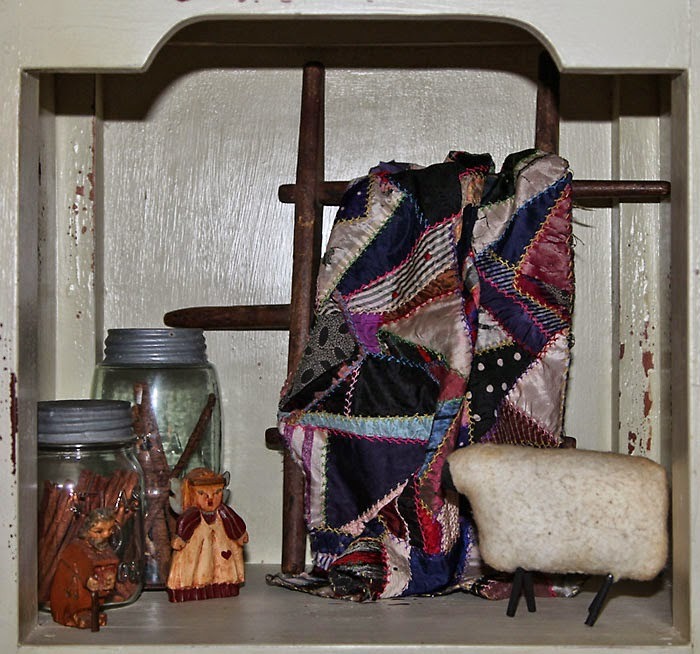 One of my favorite items is an antique yarn winder. One handle turns so you can wind your yarn, though I am not sure how they actually do it, and I got it, just because I liked it;) I put it on the shelf for now and draped a vintage crazy quilt piece, that a friend gave me. The two little figures are carvings, I did, years ago. Another thing I was hunting for, was a primitive tree to use all year round. Last week I saw them on sale and when we went back, they were all gone, that is what I get for waiting. I found a similar one, though not as prim. 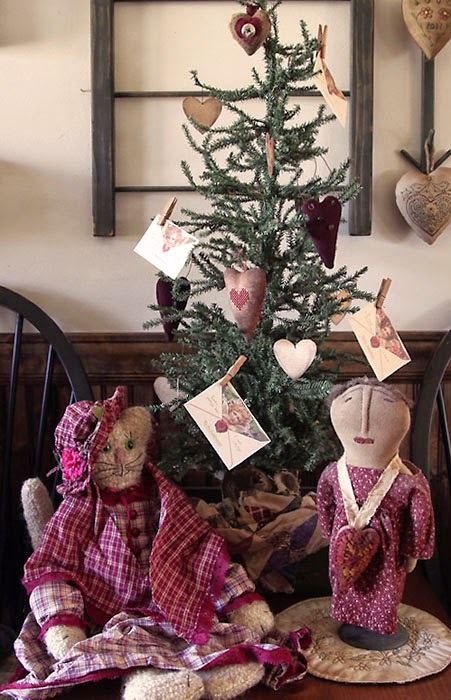 I had some hearts that were given to me and I guess I will make some more valentine items to add to the tree and then next month it can become an easter tree. I will redo the area with a table topper and valentine pieces, guess I need to get busy. We also went to an antique store and I found a used basket that I can put in my sewing room and they also had lavender that you bought by the scoop, so I was happy to find that. I put a lavender sachet in my wool box and it keeps the wool smelling fresh. On the way back we stopped at a local pottery store, they had beautiful pottery but nothing I could use with my decor. The store is in an old mill building next to a river and the falls were beautiful to watch as they tumbled over the rocks. I hope you all had a wonderful weekend and if you want something fun to make for Valentines, visit Bird in the Hand Primitives. Robin has a wonderful free pattern today. 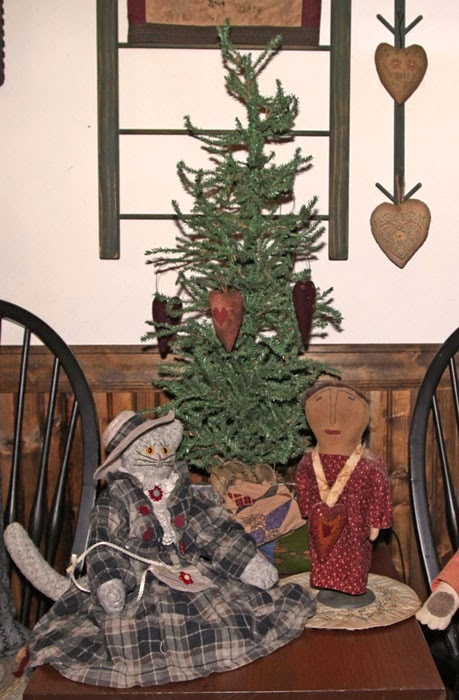 And when you visit, you will noticed the doll in her banner is the same as the one next to my tree. I was the lucky winner of her valentine doll and I just love her. This week I decided to take apart my rug and start over. This time I did traditional rug hooking and I was able to hook it all, in half the time it took me to do the part, I punched. I guess for me, hooking is faster and easier or I am doing something wrong. The original design is a bit lighter and brighter, so I made mine a little more prim with some fun colors, as well. I haven't finished it yet, still deciding on how I want to finish it off. Mounting it on a board, adding a braided edge or maybe make it into a pillow. I lightened it up so you could see the design better. When doing photos of my pieces, some colors come out too dark and others, too light. The piece measures 11 1/2" x 9". 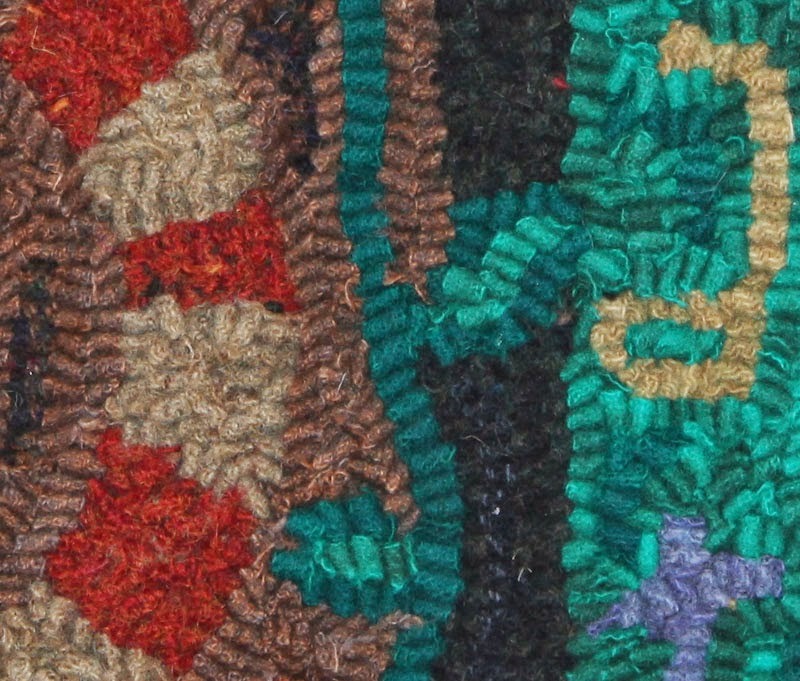 Here is a closer look at the hooking and wool shades. Some wools are over dyed thrift and some as is and the background is a black check that has an aged green cast to it. With the cold weather we have been staying inside and Bean has way too much energy to just sit and relax so we have play times and times in the cage so I can relax for a few minutes. 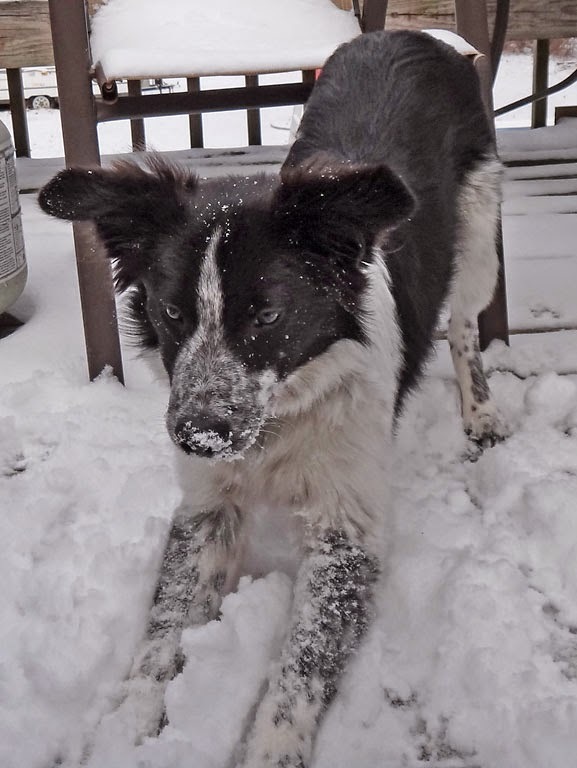 Today we got a blast of snow in the morning and Bean loved playing with it, while I shoveled off the porch. Now if I could just teach him how to push a shovel;) I hope everyone has a wonderful weekend. 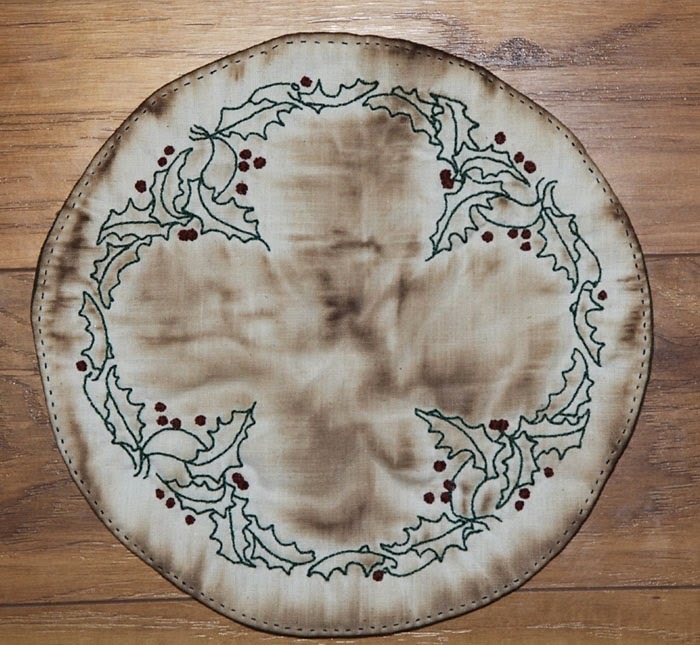 I finally finished my candle mat and it is my first finish for the new year and my first piece for my Christmas box. The design can be found on Q is for Quilter along with a second holly design. I used Finca #8 on the leaves and it really is a nice floss, stitches nicely and smoothly. When I finished I used walnut spray and it seems to have made it's own design in the middle. I also started a rug, which a friend sent me for Christmas. It is a fun pattern and I thought it would be fun to try punching with it. I am not so sure about the punching, it is way too packed, especially on the cat. The wool is thick and a dark brown with specks of white and black in it, so it is a fun yarn, but maybe I need to take some rows out and see if that helps. 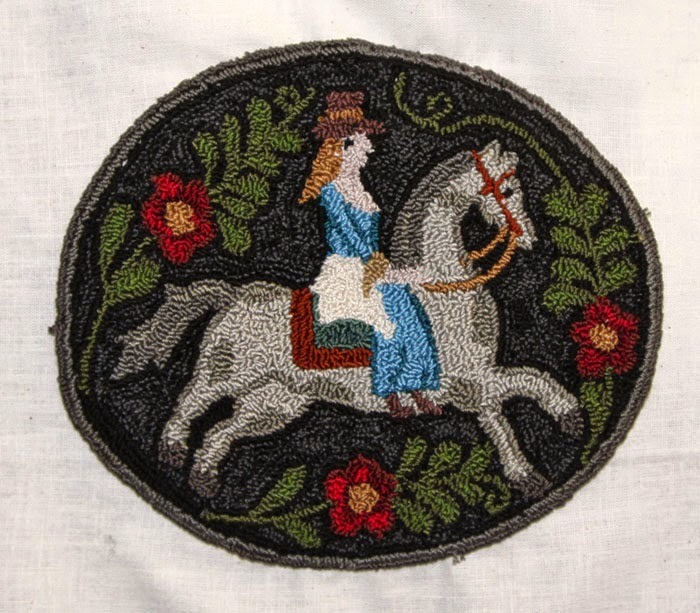 I was thinking of doing the design in punch and the background in wool hooking, but not sure? My frame is not big enough to do punching all around, so it is either that or pull it all out and start over with wool and regular punching, which I am leaning towards. The design is by American Pie Designs. I also think it would be easier with a smaller rug punch, mine are size 10 and I find it hard to punch and tiring after a while. This week, Bill had off so we did a lot of driving around and just having fun. 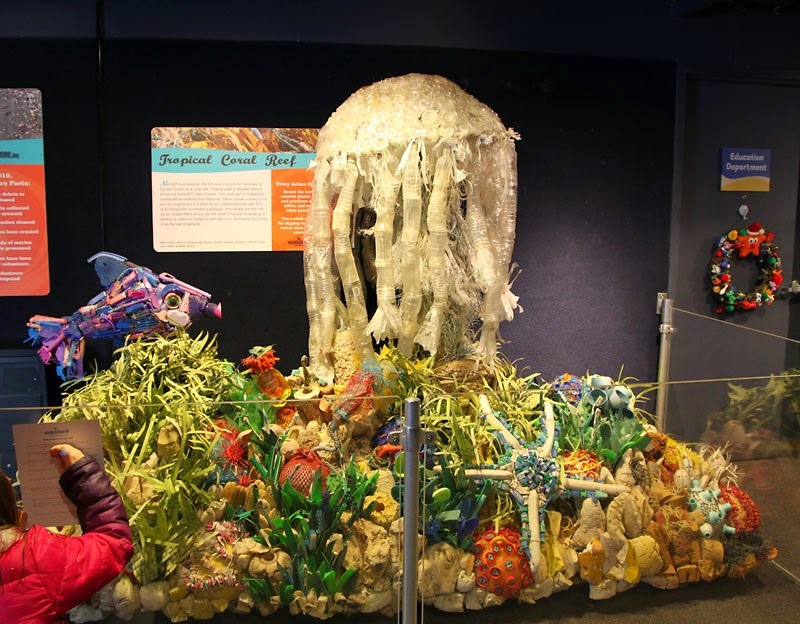 One of the things I wanted to do, before the exhibit was gone, was to see the found art exhibit at the aquarium. 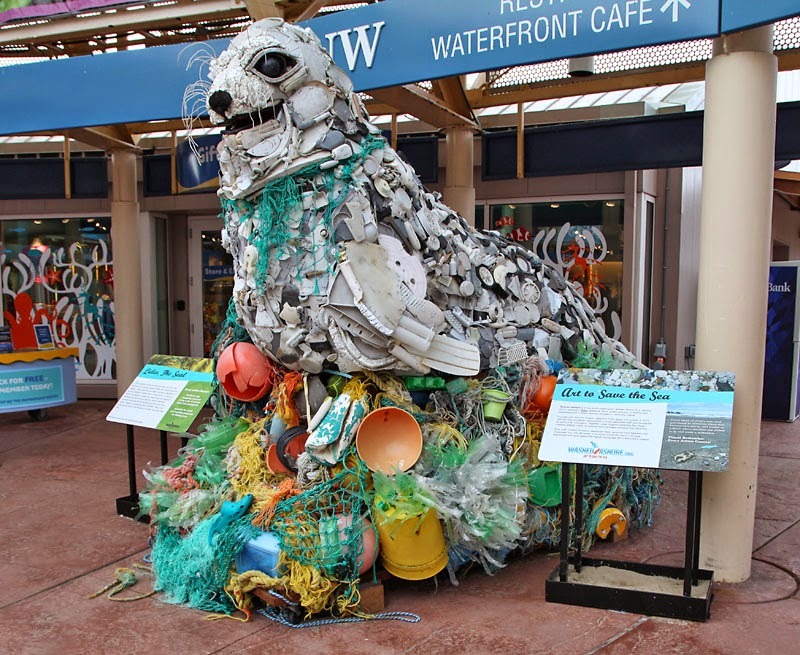 Artists took items that they found on the beaches and made art pieces from them. There were large ones and smaller ones, and amazing what they did with junk that inconsiderate people threw on the beach or items washed up on shore. This piece was fun and made from all types of trash, but it became something fun and beautiful. Inside was a giant Jelly Fish on a coral reef, so much creativity in the use of found items. 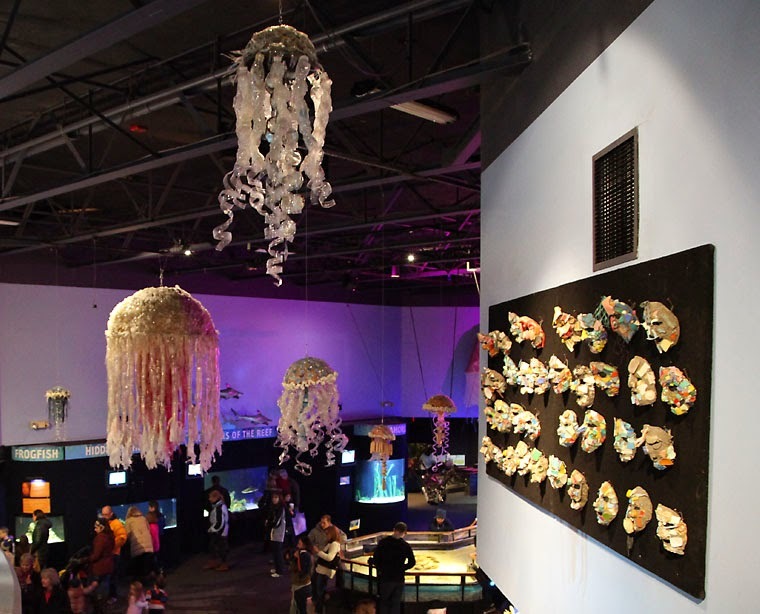 And Jellies hanging from the ceilings, as well as a wall of masks. It was fun seeing all the art and we walked around and enjoyed the indoor tanks, but it was so crowded, we didn't stay long. 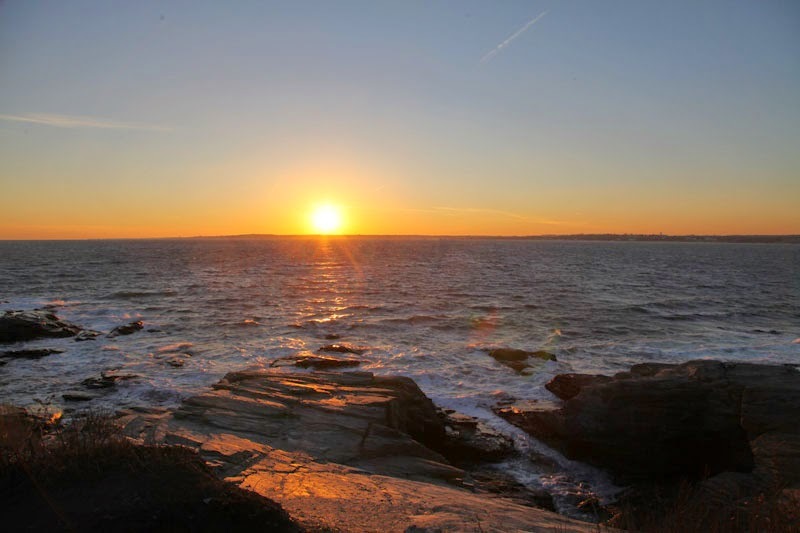 Another place I have been wanting to see, was in the same area, so we headed to Enders Island, which is a small island in the Mystic Connecticut area. It is home to priests and retreats. 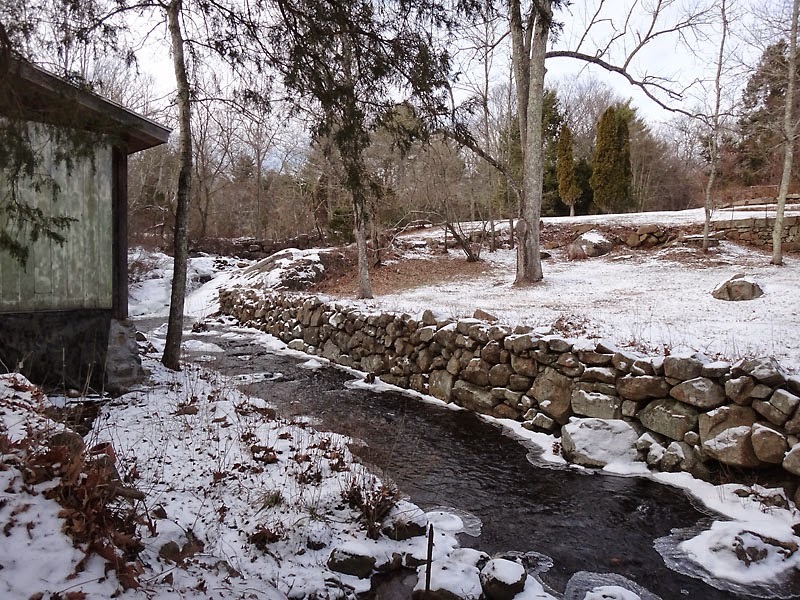 It was was cold and barren but still beautiful with it's stone walkways and views of Fisher's Sound. 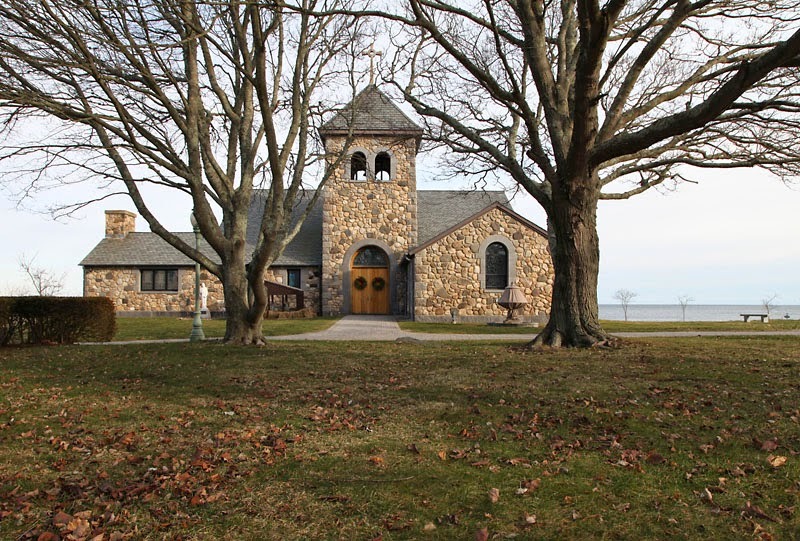 The church would be beautiful to attend a service at, imagine having a retreat here. With a new year, we did a few new things that we never make time for. 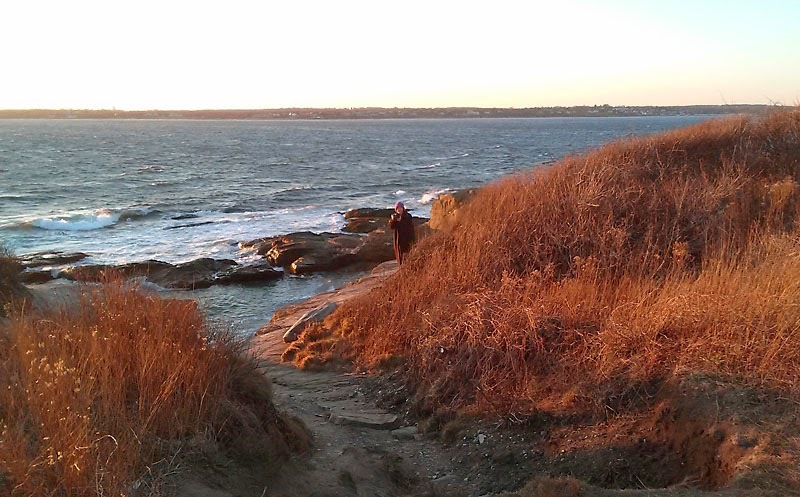 One was driving to the lighthouse to watch the sunset. The problem was, I forgot my gloves, so my hands froze and I couldn't move them after sitting out in the cold winds. Bill was taking photos with his pad, so he caught me taking photos from the cliffs. And this is the sun setting over the horizon. The colors just got more magnificent as the sun went down, but by then, it was too dark to pick up the colors and my frozen hands couldn't even press the shutter. It was a wonderful way to end the first day of the new year. And to top it off, I went outside that night and caught a flaming meteor as it flew overhead. What a way to start off the New Year. I hope your new year is filled with many joys and blessings.